Apple strudel looks fancy but, with a little practice. it is not hard to make. Once you get the hang of stretching the dough, you will never want to go back to a thick crust. 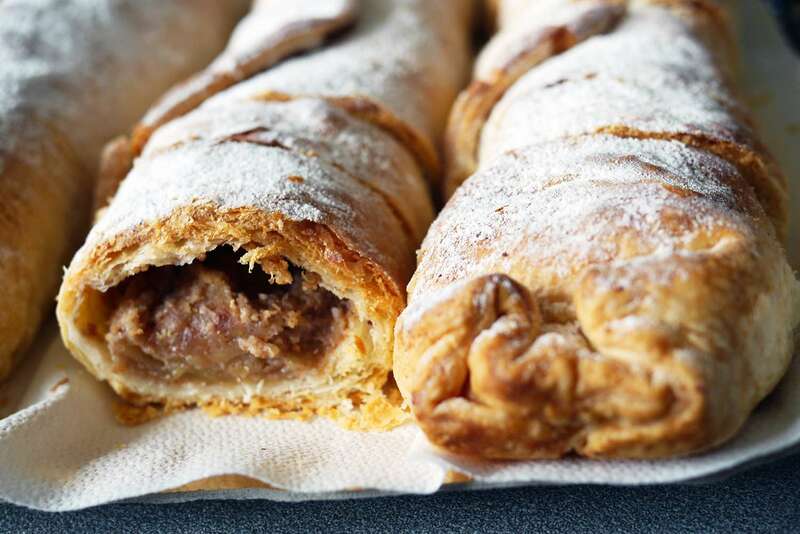 Inside an apple strudel, you will find cinnamon, breadcrumbs, nuts, and raisins. The recipe has a good filling-to-dough ratio. This cheesecake puffs up in the oven and then settles into a dense, creamy filling. Yogurt and cream cheese can be substituted for the quark in this recipe if it's hard to find. This simple recipe is made with a purchased sponge cake base that is topped with vanilla pudding and fresh fruit. This German-style apple cake recipe features a shortcrust base, chopped apples, and a lemon-flavored cake layer. The sugar and almonds sprinkled on top make a delightfully crunchy topping. This homemade streusel cake with fruit filling is the closest German cooks get to a pie. Here, the streusel crust is much richer than pie dough and is pressed into a springform pan. Cherries or any fruit, especially stone fruit, thickened with cornstarch (Germans would use potato starch) make a great filling. You can even use canned fruit filling. Using whole-wheat flour, apples and agave syrup makes this apple cake moist but not too dense. This is a simple batter cake made with yogurt and baking soda for the rise. Half the apples are folded into the dough and the other half placed on top in a beautiful rosette pattern. A cream is drizzled over the dough for a type of apple gratin effect. This Black Forest cherry cake has cherry schnapps, known as Kirschwasser in German, in the filling which gives it quite a kick. You can leave it out if you are serving to children. The frosting is whipped cream, so assemble this cake on the day you are serving it. Fresh apples combine with a vanilla-flavored cream in a shortbread-like crust to create a wonderful cake that everyone likes and is popular for afternoon coffee and cake. Three layers make up this cake: a yeast dough base, quark-cheese filling (like a sweet, cream cheese filling) and crunchy streusel topping. It makes a large jelly roll pan-sized cake. This simple batter cake is spread in a springform pan and then topped with fresh apricots before baking. It's great with a dollop of whipped cream. When you have ​some extra sourdough starter that is left after feeding your culture, make this sourdough coffee cake which is a bit like sour cream coffee cake in taste and goes with a cup of tea or coffee very nicely about mid-morning.